For the perfect addition to an autumn dessert buffet, try these mini pumpkin pies — flavor-enhanced with toffee bits — decorated with adorable "acorn chocolate kisses". 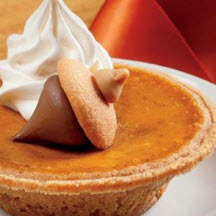 Prepare Toffee Pumpkin Pies: Preheat oven to 350°F (175°C). Place individual graham crusts on baking sheet. Place 2 teaspoons toffee bits into bottom of each crust; set aside. Stir together sugar, salt, cinnamon, cloves and ginger in large bowl. Add eggs, pumpkin and evaporated milk, stirring until well blended. Gradually add 1/4 cup pumpkin mixture to each prepared crust. Bake 35 to 40 minutes or until knife inserted into pie center comes out clean. Cool completely on wire rack. Cover; refrigerate until ready to serve. Prepare Royal Icing: Stir together powdered sugar, warm water and dried egg whites. Beat at medium speed of electric mixer until spreadable. Add additional water, 1 teaspoon at a time, if too thick. Divide icing into small bowls for each color desired and tint with food colorings. Transfer icing to pastry bags with desired tip. Cover icings and tips of pastry bags with damp paper towels to keep icing from drying out. (Some icing garnishes may need a firmer icing to hold their shape. Stir in small amounts of additional powdered sugar to get the desired consistency.) Makes about 1/2 cup icing. Prepare Kisses Acorn Treats: Remove wrappers from milk chocolates. Place mini vanilla wafer cookies on tray or plate with flat side of cookie toward the top. Squeeze small amount of icing onto bottom of milk chocolate piece. Immediately press chocolate bottom onto vanilla wafer cookie. Allow icing to set. Place small dab of icing on bottom of peanut butter chip or butterscotch chip; immediately attach to top of cookie to finish acorn. To Serve: Top each pie with dollop of sweetened whipped cream, an "acorn" and additional toffee bits, if desired. Makes about 20 (3-inch) pies.